Innovations Series Explores the Latest Breakthroughs in Power Solutions, Featuring Manitoba Hydro International Ltd.
DMG Productions explores recent advances in power solutions. 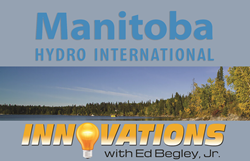 Innovations w/Ed Begley Jr., announced today that it will feature Manitoba Hydro International Ltd. (MHI) in an upcoming episode, airing third quarter 2016 via Discovery Channel. Dates and show times TBA. For over 30 years MHI has provided innovative services and solutions to customers in the energy sector around the world. In this segment of Innovations, viewers will be educated on MHI’s high voltage testing services, offered in association with Manitoba Hydro’s state-of-the-art High Voltage Test Facility. MHI is a wholly owned subsidiary of Manitoba Hydro, one of the largest and longest-standing energy utilities in Canada. Manitoba Hydro is the province’s major energy utility, serving over 561,000 electric customers and 274,000 natural gas customers throughout Manitoba. Manitoba Hydro generates nearly all its electricity from self-renewing water power using 15 hydroelectric generating stations located throughout the province. Manitoba Hydro International Ltd. (MHI) provides innovative services and solutions to customers in the energy and telecommunications sectors around the world. Leveraging its international experience and the parent utility’s methods and technologies, MHI offers sustainable results and superior value. MHI’s five divisions provide a wide variety of services, including engineering consulting, project and contract management, transmission line design, modelling, and analysis, high voltage maintenance and construction, training, and more. Dedicated to creating lasting relationships, MHI collaborates closely with clients to achieve their specific needs and desired outcomes. For a complete overview of MHI’s service offerings please visit: http://www.mhi.ca. For more information visit http://www.InnovationsTelevision.com or contact Michael Devine at (866) 496-4065 x 824 or via email at michael@InnovationsTelevision.com.